Cancer Cell, 2015, 27(3): 397-408 . Ceritinib (LDK378) purchased from Selleck. H3122 cells expressing pRS or shSMARCE1 vectors were cultured in the absence or presence of 100 nM NVP-TAE684, 400 nM Ceritinib, 1 μM gefitinib or their combination for 3 h. Cell lysates were harvested for immunoblot analysis and probed for the indicated proteins. Cell Res, 2015, 25(4): 445-58. Ceritinib (LDK378) purchased from Selleck. Immunoblot of BEAS-2B/LacZ and BEAS-2B/EA samples treated with serially diluted concentration of crizotinib (CZT) and ceritinib (CER; 0, 0.01, 0.1, 0.5, and 1 μmol/L) for 48 hours. Results are shown as means ± SD (N=3). Clin Cancer Res, 2018, doi:10.1158/1078-0432. Ceritinib (LDK378) purchased from Selleck. Immunoblots of integrin b3 expression in H3122 and H2228 cells treated with DMSO (0 mmol/L), 1 mmol/L crizotinib (CZT), or 1 mmol/L ceritinib (CER) for 48 hours. Clin Cancer Res, 2018, 24(17):4162-4174. Ceritinib (LDK378) purchased from Selleck. (A) H3122 LDK_R show increased invasive and migratory capabilities compared to parental H3122, (B) loss of E-cadherin and increased mesenchymal markers including vimentin and AXL. Knockdown of vimentin decreased AXL expression in H3122 LDK_R. Mol Oncol, 2016, 10(4):601-9. Ceritinib (LDK378) purchased from Selleck. Does not cross react with c-Met, and has an improved in vivo glucose homeostasis profile relative to TAE684. May be active in Crizotinib-relapsed tumors. Method: Luciferase-expressing cells are incubated with serial dilutions of LDK378 or DMSO for 2-3 days. Luciferase expression is used as a measure of cell proliferation/survival and is evaluated with the Bright-Glo Luciferase Assay System. IC50 values are generated by using XLFit software. Marsilje TH, et al. J Med Chem. 2013, Jun 6.
how to reconstitute the inhibitor for oral administration to mice? You can resuspend LDK378 in 30% PEG400/0.5% Tween 80/5% propylene glycol and use the suspension for oral gavage feeding. GSK1838705A : IGF-1R, IC50=2.0 nM; IR, IC50=1.6 nM, ALK, IC50=0.5 nM. ASP3026 New : Novel and selective inhibitor for ALK with IC50 of 3.5 nM. TAE684 (NVP-TAE684) : Potent and selective ALK inhibitor with IC50 of 3 nM, 100-fold more sensitive for ALK than InsR. PF-06463922 is a potent, dual ALK/ROS1 inhibitor with Ki of <0.02 nM, <0.07 nM, and 0.7 nM for ROS1, ALK (WT), and ALK (L1196M), respectively. Phase 1. 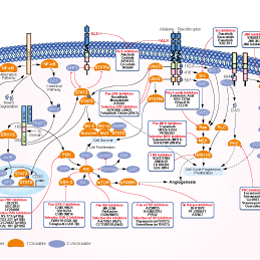 Features:A small-molecule kinase inhibitor of IGF-1R and the insulin receptor. 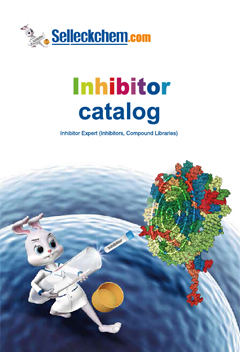 Alectinib (CH5424802) is a potent ALK inhibitor with IC50 of 1.9 nM in cell-free assays, sensitive to L1196M mutation and higher selectivity for ALK than PF-02341066, NVP-TAE684 and PHA-E429. Features:At least 10-fold more potent and selective in ALK inhibition relative to crizotinib.